The Case IH Axial-Flow 2588 combine, while not a new model, employs the Case IH patented rotor transition cone with a rotor impeller system and customizable grate attachments to thresh and separate grains with minimal grain damage. The 2588 combine stands at 12.9 feet with a wheel base of 11.2 feet, and grain tank capacity of 290 bushels. With a 305 horsepower engine and a hydrostatic drive transmission, it is capable of threshing grains at rates of 450 to 1125 revolutions per minute. For optimal threshing and harvesting of wheat with this combine, observe some basic pointers. Increase efficiency of the Case IH 2588 combine during difficult harvests. When congestion becomes a problem during challenging harvesting conditions where green weeds are prevalent, take steps to move the excess green material through the rotor cage. Either reduce clearance of the rotor to concave (the rounded internal sieve-portion of the thresher) or increase the rotor revolutions per minute (RPM). Additionally, to ensure minimal grain loss, attach notched separator bars on the rotor over the separator grate area. For especially hard to thresh areas, assist the combine by slowing down two or more transport vanes over the concaves. In general, however, varying rotor speed should work out any kinks in combine operation. Adjust reel and draper speeds on the combine. For optimal performance of your Case IH 2588 combine, adjust the reel and draper speeds. The reel is what rotates to bring the grain into the draper header. Position the reel and set it so that it lightly flicks the crop onto the draper (without impeding it). Reel speed should be 10 percent faster than ground speed. However, draper speed is not dependent on ground speed and does not increase capacity. Reduce rotor aggression on your Case IH 2588 and move material quickly. Depending on what type of rotor you have on your combine, you can remove any separator bars and replace them with other bars for better performance. For standard rotors, take out the first two sets of smooth rasp bars and replace with smooth separator bars. For specialty rotors, take out the straight separator bars and replace with rasp bars. Do not use spiked rasp bars unless trash is abundant. Adjust the transport vanes over both the separator grates and concave area to the fast position to speed threshing progress. 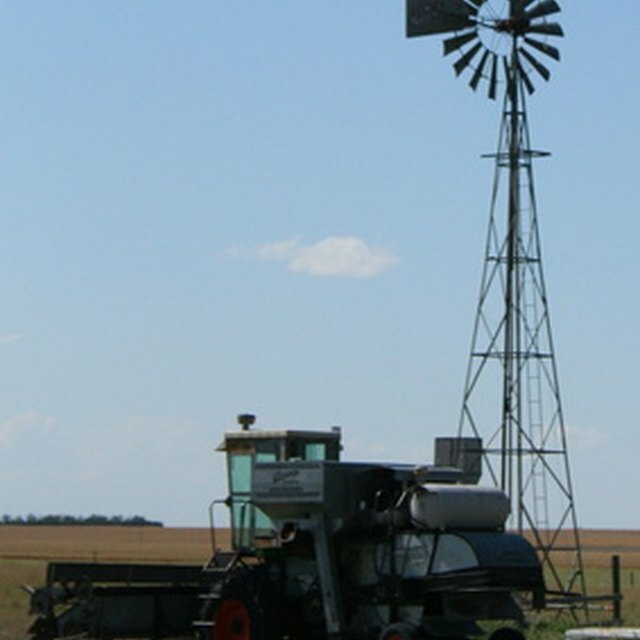 Configure the rotor cage of the combine for smoother flow. Improve flow by using small wire concaves, and slotted grates with bars on the outside at the 1/2 hole position. Use solid separator grates in the second and third positions if grain loss is not a concern. Address the particular needs of wheat. If you find that as you thresh wheat using the Case IH 2588 combine that the product is not up to par, you can make adjustments to improve the grain quality. If the wheat grain is damaged, first decrease the rotor speed, open the sieve shoe, inspect the concave for plugging then finally open the concave. If there are unthreshed heads, increase the rotor speed, close the concave and close the shoe. Other problems may involve heavy stems and fines as well as grains blowing over the chaffer or sieve overloading, each of which calls for specific adjustments. Always put the shift lever in neutral before starting the engine. Drive at moderate speeds in the field. Dress appropriately, so that clothing does not get caught in the machinery. Be sure all is clear before unloading grain. Flowing grain can trap a person in less than 10 seconds. Engage the feeder cylinder safety stand when working under the header or feeder. Xi, Timothea. "How to Harvest Wheat With a Case IH 2588 Combine." Sciencing, https://sciencing.com/how-7683107-harvest-case-ih-2588-combine.html. 09 January 2018.